Once a month we get together for a whole food plant based pot luck with a lovely group of friends. The friendships, conversation and food is fabulous. We always get introduced to some new recipe and get to try some new foods as well. 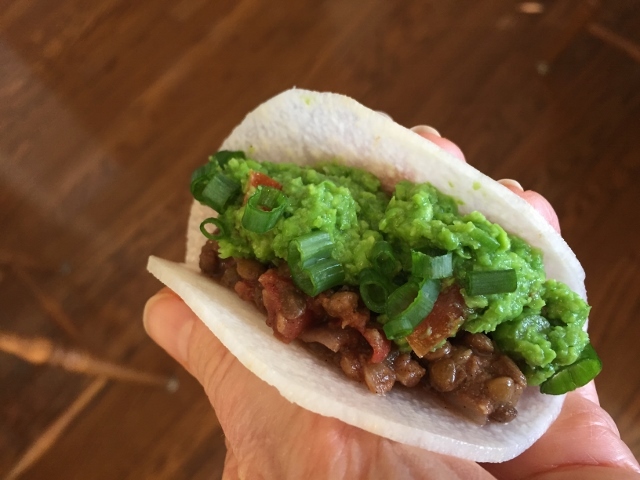 My friend Lorna introduced us to lentil tacos using jicama tortillas! I had seen some jicama tortillas on line but had yet to find them in any store locally. Lorna made her own using a mandolin slicer. Brilliant! I have since made them myself and they are very easy to make and so delicious! 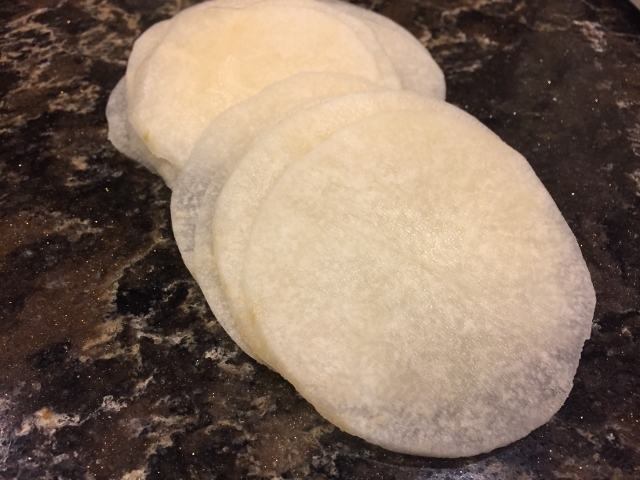 The jicama tortillas are smaller than a regular corn tortilla which makes them perfect for appetizers or for a pot luck/buffet. 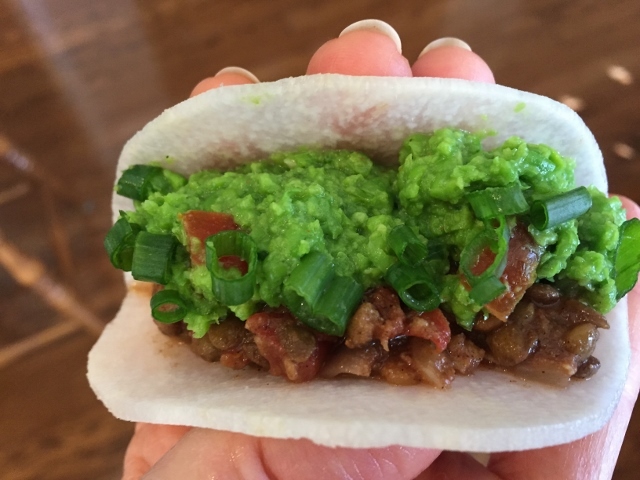 They are crisp yet flexible enough to bend around the filling and can be eaten out of hand just like a regular taco. You will have to have a mandolin to cut the jicama thin enough for a tortilla – I doubt that you can get the same result with a sharp knife. The trick is to find a jicama small enough to fit on your mandolin slicer. This one was slightly larger than I needed but by the time it was peeled it was the perfect size. 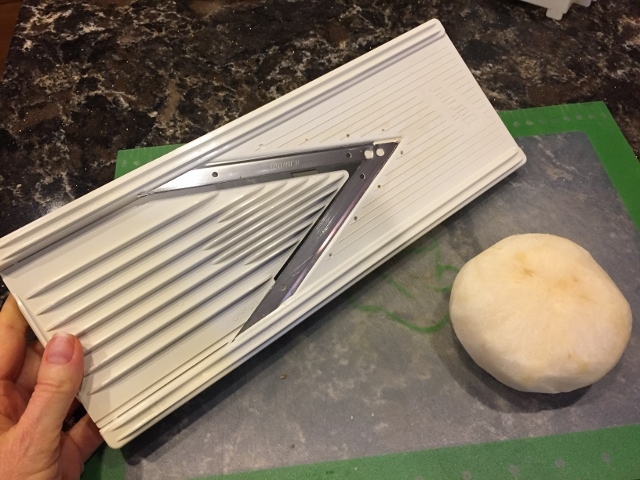 I have had my mandolin slicer for over 20 years and it still works great. I have had this mandolin slicer for about 20 years or more! I got it from one of those demonstrations at the California State Fair and although I don’t use it often when I need something sliced thin it does the perfect job! 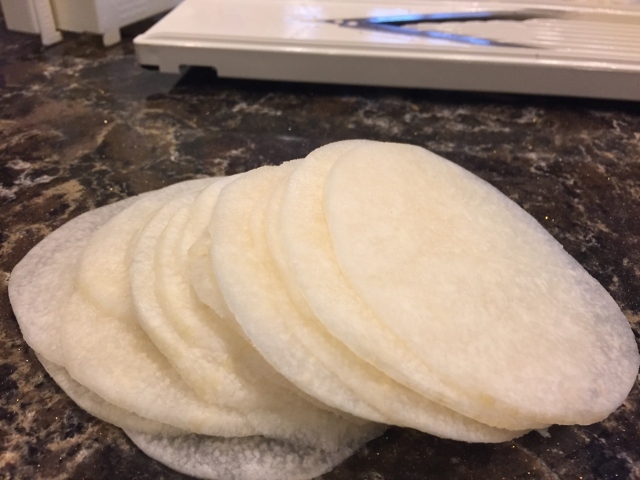 One jicama made plenty of tortillas. If I was serving them to a group I would use two jicamas. Experiment with your mandolin to find the right thickness. You want them to be flexible enough to bend around the filling.The jicama tortillas stayed fresh in the fridge for about 4 days. Use your favorite taco filling. We happen to love this one for Chili Lentils for Tacos that we have been using since before we even transitioned to a whole food plant based diet. Its perfect for tacos, taco salad, nachos and as a topping for baked potatoes. 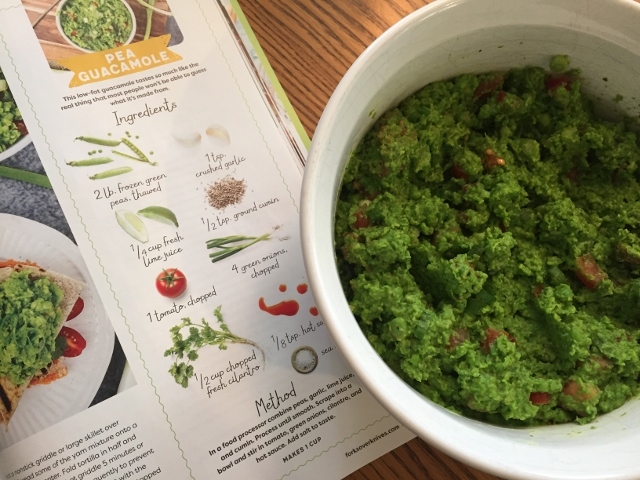 For the Pea Guacamole I used the recipe from Forks Over Knives. Instead of the hot sauce called for in the recipe I used red pepper flakes and it was perfect. It was good as a topping on baked potatoes too! If you want a cheezy sauce I suggest using Donna’s Vegan Cheeze Sauce – it’s our favorite vegan cheeze topping. 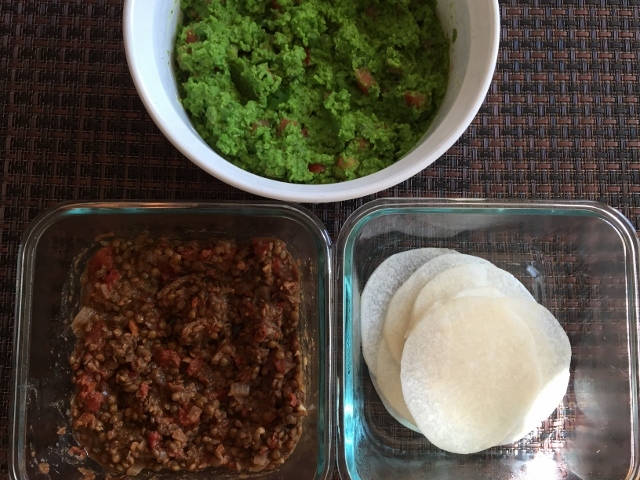 Make my Easy Red Salsa or Salsa Verde to go with these tacos. This is something fun to share at your next whole food potluck! HAVE YOU TRIED JICAMA TORTILLAS? When you use our Affiliate Links you help support our work here without any extra cost to you. Thank you for your support. Check out our Amazon Affiliate Page where we share our favorite small kitchen appliances, food, cookbooks and fun things for the grandchildren. We are also a Holland Bowl Mill Affiliate and when you purchase a minimum $125 with our affiliate link you get a free mezzaluna knife! 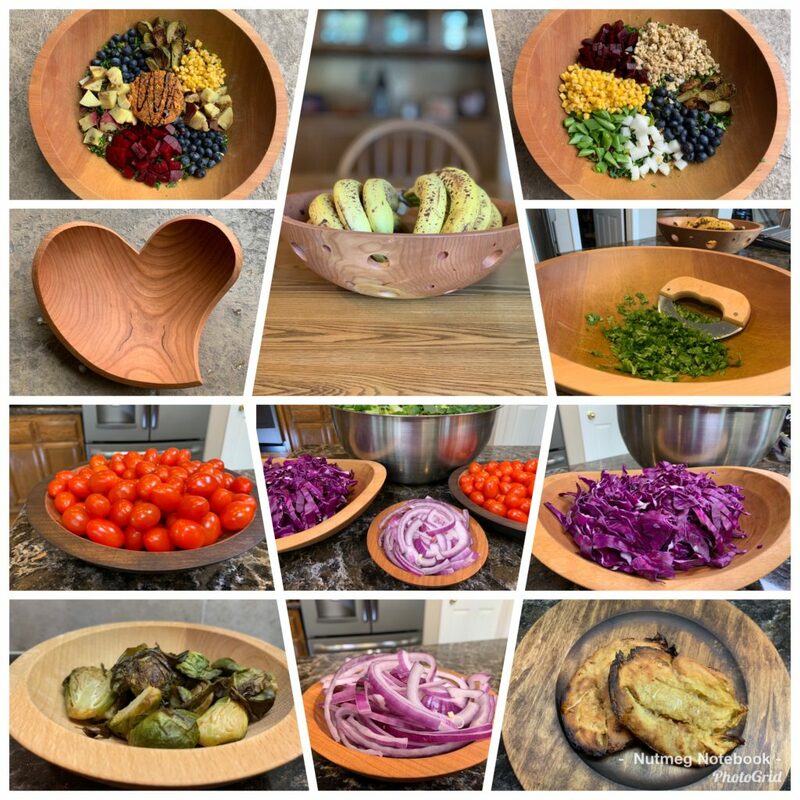 See My How To Make A Chopped Salad Using The Holland Wood Bowl post and video for all the details! 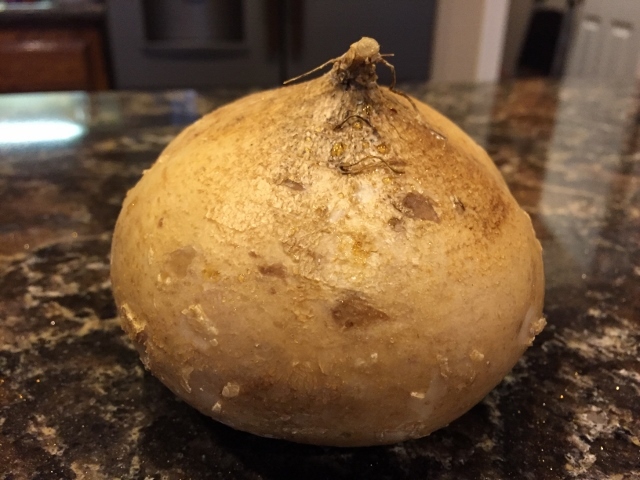 Why not make those jicama tacos for our next potluck on April 29? Phil and I have been married 42 years! I’ll consider it but most likely will make something in the Instant Pot! HAPPY ANNIVERSARY! Love that pic!!! What really concerns me more and more is the WATER QUALITY in OC cities. Horrible chemicals in our tap water. I checked my city ( Aliso Viejo) and found Fluoride is added. Uggh. Thanks for the link Bernice! You can always use bottled water or filtered water. Thanx for the recipes! We’ve been married for 32 years.